George Soros is heartened by current efforts to revive growth in the worlds major economies, the hapless eurozone being the one exception. George Soros is heartened by current efforts to revive growth in the world’s major economies, the hapless eurozone being the one exception. “All of the looming problems for the global economy are political in character,” he writes. Shale energy is an important competitive advantage in manufacturing in general and in petrochemicals in particular. The banking and household sectors are deleveraging. Quantitative easing has boosted asset values. The housing market has improved, with construction lowering unemployment. The fiscal drag exerted by sequestration is about to expire. “More surprising, the polarization of American politics shows signs of reversing,” Soros writes, the fever apparently having broken after the recent government shutdown. In Japan, Prime Minister Shinzo Abe is launched on a “risky experiment” of massive quantitative easing in order to reinvigorate a long-stagnant economy. “Faster growth could drive up interest rates, making debt-servicing costs unsustainable,” Soros writes, but Abe and the Japanese man in the street consider the risk worth taking. But “the major uncertainty facing the world today is lies in the future direction of China,” he writes. “The growth model responsible for its rapid rise has run out of steam.” This constrained the household sector, now only 35% of GDP, in order to drive export and investment growth. But the forced savings can no longer finance the current growth model, leading to a huge rise in the use of various forms of debt financing. Soros sees some “eerie resemblances” with financial condition in the U.S. leading up to the 2008 crash, but also a significant difference. Financial markets tend to dominate politics in the U.S., whereas the state owns banks in China and much of the economy, and the Communist Party controls state-owned enterprises. Sensing danger on the horizon, the People’s Bank of China started curbing growth of debt in 2012. In mid-2013, when the slowdown was causing distress in the economy, the leadership ordered the steel industry to restart the furnaces and the PBOC to ease credit. “The economy turned around on a dime,” Soros writes. However, an unresolved self-contradiction exists in China’s current policies, according to Soros. “Restarting the furnaces also reignites exponential debt growth, which cannot be sustained for much longer than a couple of years. He writes that successful transition in China will likely entail both political and economic reforms; failure would undermine continuing trust in the country’s political leadership, resulting in repression at home and military confrontation abroad. The current arrangements governing the euro are here to stay, Soros thinks, because Germany will always do the “bare minimum to preserve the common currency.” Moreover, the markets and European authorities would punish any other country that challenged these arrangements. Still, the acute phase of the financial crisis has passed, Soros writes. European financial authorities, having tacitly recognized that austerity is counterproductive, have eased off. Debtor countries have gained breathing room, and financial markets have stabilized—even in the absence of any growth prospects. Soros considers the absence of proper global governance to be the world’s other great unresolved problem. Lack of agreement among the U.N. Security Council’s five permanent members is aggravating humanitarian catastrophes in countries like Syria, and global warming is allowed to proceed largely unhindered. 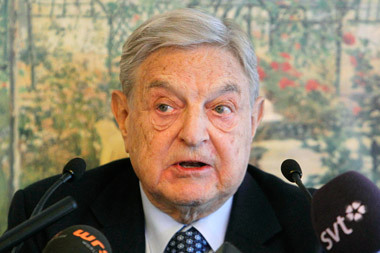 Check out Soros: Germany Should Lead Eurozone or Leave It on ThinkAdvisor.